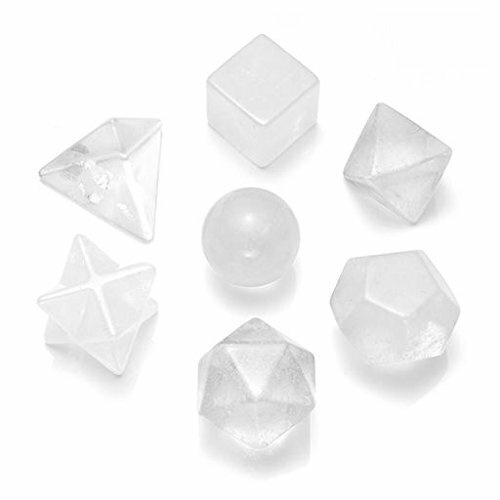 Why choose Plantonic Solids Stone? ♥♥This stone set amplifies prayers, wishes and positive visualizations. Keeps you in touch with your spiritual side, and reminds you that you are a spiritual being, having a human experience. All spiritual pursuits can be stimulated and amplified using this stone's energy. It helps you to be receptive to higher guidance. Amplifies, focuses, stores, transforms, energizes. Perfect for focusing affirmations and prayers. Stimulates psychic perception. ♥Crown-Sahasrara; Clear Quartz can :Alleviate pain and reduce fever;Helps treat heart, bowel and stomach problems;Remove mental blocks by bringing in positive energy;Calm and relax yourself by holding a crystal sphere in your hand. ♥♥90-Day money back guaranteed. If you are not completely satisfied with the product, please contact us. Clear Quartz Crystals Plantonic Solids-polished,smooth,hand carved,size and shape are standard,but the color will be slightly different,because of the natural gemstone. Weights 50g/7 piece. ABOUT The Platonic Solids-- are the repeating geometric patterns that are the basic building blocks of life. All of life as we know it is composed of these geometric structures: our physical bodies, cells, DNA, plants, animals, minerals, planets, solar systems, stars, galaxies and Universes, the microcosm and macrocosm are endlessly repeating these archetypal patterns. BENEFITS-- This stone set amplifies prayers, wishes and positive visualizations. Keeps you in touch with your spiritual side, and reminds you that you are a spiritual being, having a human experience. All spiritual pursuits can be stimulated and amplified using this stone's energy. It helps you to be receptive to higher guidance. Amplifies, focuses, stores, transforms, energizes. Perfect for focusing affirmations and prayers. Stimulates psychic perception. Design Idea -This beautiful set contains 9 specialized Crystals faceted into the Sacred Geometric shapes known as the Platonic Solids. Excellent energy enhanced set for Chakra clearing and Balancing, Reiki, energy healing,crystal grids, Meditation, Dreamwork, work Ceremony, Energy Grid, Activations Environmental ,Space Clearing, Feng Shui. Wonderful Gift-Comes with a great Gift Box and A VELVET Bag. Ready for giving.Suitable for any occasions like birthday, Christmas, Father's Day, Valentine's Day and other holidays! For yourself/your friends/your love. 92-Day money back guarantee.If you are not completely satisfied with the product, please contact us through buyer seller message. Buy absolutely no risk. If you have any questions about this product by MANIFO, contact us by completing and submitting the form below. If you are looking for a specif part number, please include it with your message.